Rabbi Menachem Kutner, Director, Chabad’s Terror Victims Project (CTVP) was joined by Rabbi and Mrs. Meir Shimon Moskowitz, Chabad Shluchim from Chicago, as they went to bring comfort to the grief-stricken families of two young people whose lives were brutally cut short in the Barkan Industrial Zone in Israel. They were joined by Rabbi Binyamin Akiva and his son Rabbi Avigad, Chabad Shluchim from Rosh HaAyin, where Kim Yechezkel lived. She was just 28 years old, married and the mother of a two-year-old. She’d simply gone to work that morning, only to be murdered by a 23-year-old terrorist. Kim’s father told Rabbi Kutner and the others that somehow, with a father’s intuition, he knew something was wrong when he heard of the attack. He rushed to the scene only to have his worst fears tragically realized. He told his visitors about the many acts of kindness his daughter did secretly, without any fanfare. She would help the needy often. As early as when she was in school, she took under her wing a classmate who had been rejected socially by the other students and “adopted” her for many years until she found her own way in society. 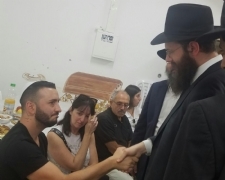 In Rishon Letzion, Rabbi Kutner and the Moskowitzs joined the Chabad Shaliach from there, Rabbi Yinon Sasson, to bring comfort to the grieving family of Ziv Hajbi who was also brutally murdered in the Barkan Industrial Zone the same morning. While visiting both families, Rabbi Kutner suggested the idea that this coming Chanukah, a menorah be lit in the Barkan Zone in memory of the two terror victims – to bring light to a place of darkness. 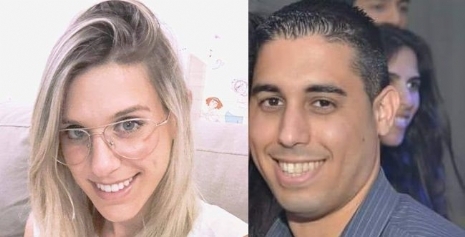 Both families felt this was appropriate and arrangements will be made by the Chabad Shaliach of the Barkan Industrial Zone, Rabbi Mendy Kornet. We pray that those families will be comforted among the mourners of Zion and Jerusalem.